Chinese manufacturers took six of places in the global top ten smartphone manufacturers in the first quarter of 2017 with one in ten phones sold worldwide made by Huawei, according to a report by market research agency IDC. Three of the top five were Chinese, from zero just five years ago. While the global heavyweights Samsung and Apple still hold first and second place—and by quite a margin—the gap between second-place Apple and third-place Huawei is beginning to narrow as Apple’s sales fell 1% to 50.8 million units compared to the previous year whereas Huawei’s sales surged 22% to 34.6 million. At the top, Samsung managed 1% growth year on year to reach 80 million handsets. The real growth came from the final two firms making up the top five: fourth-place OPPO saw a whopping 93% leap to 25.5 million shipments and fifth-place Vivo saw 82% growth up to 22.7 million shipments. 52 countries saw shipments of Chinese smartphones grow by over 50%, 32 by over 100%. This means that in 31 countries Chinese brands make up more than 15% of the market and 21 where market share is more than 20%. 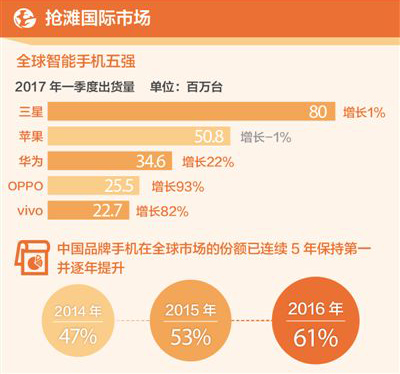 Smartphone shipments within China show that the top three spots are taken by local brands with Huawei making up 20%, OPPO taking 18.2% and Vivo claiming 14.1% market share. Apple limped in fourth with 9.6% of the market share, just ahead of local rival Xiaomi at 9.3%. With their figures combined, Chinese brands have dominated for the past five years with the country’s mobile phone brands making up an ever larger percentage of global shipments, standing at 61% in 2016.